Hearthstone’s latest expansion Kobolds and Catacombs launched today, featuring 135 new cards. One of them is called Violet Wurm, and as some players have noticed, it’s almost exactly like a Magic: The Gathering card that came out 17 years ago. Violet Wurm is a new Hearthstone card, a minion with eight mana cost, seven power, and seven toughness. When it dies, it spawns seven 1/1 grubs. Symbiotic Wurm is an old Magic card with eight mana cost, seven power, and seven defense. When it dies, it spawns seven 1/1 insects. 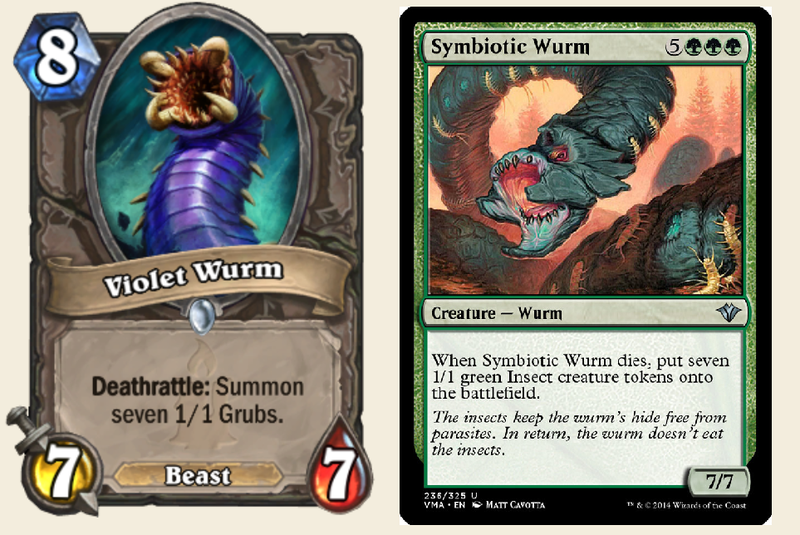 At least the artwork is somewhat different: Violet Wurm looks more like a bug and Symbiotic Wurm looks more lizardy—which makes sense, as “wurm” is a medieval term for dragon employed in a lot of fantasy games, and not an earthworm. Donais said that he didn’t even remember the old card when working on Violet Wurm as part of the Kobolds and Catacombs expansion. That’s not necessarily surprising either. As others pointed out, cryptomnesia, in which a person recalls something they saw or heard before while thinking it’s original, isn’t unheard of. Writers and musicians occasionally suffer from it, plagiarizing their past work or others’ without even realizing it. Of course, just because it wasn’t intentional doesn’t mean it still doesn’t pose issues. The weirdest part is the spelling of “Wurm.” . While Hearthstone has a number of cards with “Worm” or “Wyrm” in the title, this is the first to use the “ur” spelling. World of Warcraft’s lore, which Hearthstone’s is based on, doesn’t really mention wurms either. On the other hand they’re quite common in Magic such that they constitute an entire creature type, while Hearthstone’s worms are all included alongside wild boars and other animals in the “beasts” bucket. Donais declined to elaborate further when reached for comment by Kotaku, referring us to Blizzard PR, which has not yet responded.